Last Updated: March 26, 2019 By Katie 38 Comments -- Paid Promotion. Disclosure policy here. There’s a lot that goes into deciding that to pack in a hospital bag for baby. 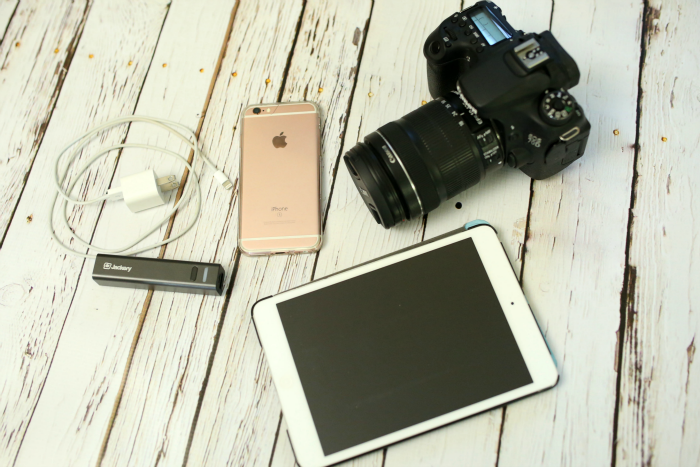 Lucky for you, I have experience with this- and I’m going to share what I packed the second time around. Before you read this post, I have something to share. 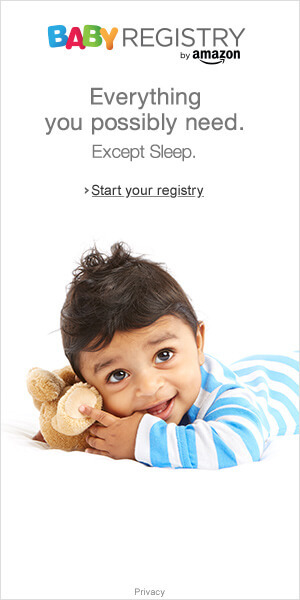 If you’ve not created a baby registry on Amazon, it’s something I recommend anyone having a baby. They have just about every product, handle returns perfectly and best of all, you get up to 15% off items that you purchase from your own registry! Click here to get started creating your own registry! 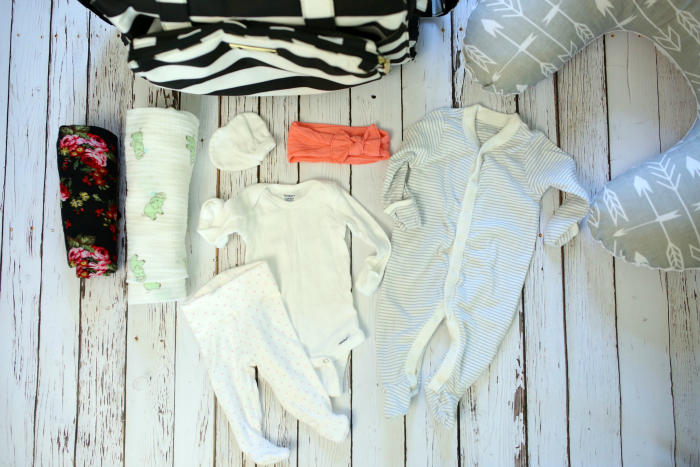 So I did this post when I was pregnant with Sam, sharing what I packed in my hospital bag for labor and delivery, but I wanted to do it again now that I’m a “seasoned pro” at this whole labor thing. I kid, I kid, but really, this time I know what I need/want to have with me, and what is completely unnecessary and I won’t be bringing with me this time. And so obviously I want to share this with you, in hopes that maybe some of you who are packing your bag will find it helpful! 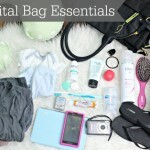 :) Without further ado, let’s get into what’s in my hospital bag… the second time around! Related: Must Have Baby Items That You’ll Actually Use. First things first, don’t forget the car seat! We have and love this Maxi Cosi seat. As far as the necessities- diapers, wipes, pads, mesh undies (aka the best things everrrr haha) and things for post-birth, our hospital supplies it all, so we won’t worry about bringing that stuff. I cannot believe that we are SO close to meeting our little princess! At 38 weeks, it could literally be any day now! And oh, I cannot wait! 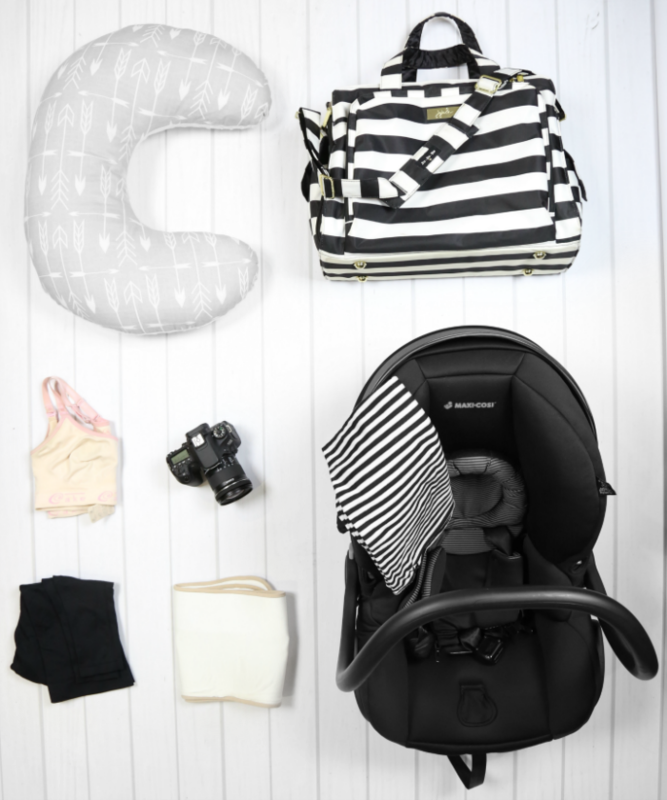 So, fellow mamas, what did you pack in your hospital bag for baby? Previous Post: « HAPPY NEW YEAR 2016 + RESOLUTIONS! I always treat myself to some yummy body wash and a new shampoo for that divine first shower after baby is born:) I have C-sections, so it’s a good day or more before I’m on my feet-and definitely time for a nice shower!!! Mmm love that! I remember the first shower after childbirth was the most DIVINE thing ever!! I will definitely save this for when I pack my hospital bag in a couple months! Where did you get those going home outfits for baby? Don’t forget to pack a few things for the hubby! Funny story – with my second, it was still a month before the due date and my husband and I were talking about how we should probably start putting a bag together. Low and behold, that night, my water broke. We were running around at 1am trying to throw one together from memory, and just hoping we didn’t forget anything. YES, the hubby! I added that in there- thanks for reminding me! ;) And oh my gosh, that is crazy timing! Just goes to show you never know when Baby is ready to come! Perfect timing on this post! I just started packing my bag yesterday. I’m 36 weeks- and feel like it’s still early- but I want to make sure we’re all ready to go! I completely over packed and ended up using a fraction of what was in my bag. -Going home outfit… Yoga pants, baggy tshirt and a sweater. -fleece bathrobe (delivered in Nov in WI so was expecting to be cold. The hospital was toasty and I was sweaty) – never wore. -slippers- didn’t use, I used the slipper socks supplied by my hospital. – toiletries. I did take 2 showers but used the body soap hosp had in shower. Used my own shampoo and conditioner. – makeup. Only used for going home. -a book that I never read haha. -belly band. It caused by uterine contractions to be too painful, specially while nursing. So I only used once in the hosp. I did use more after going home. I packed 3 outfits because I couldn’t make up my mind. But only 1 NB and my little was small. Daddy bag was the same as yours except he packed extra singles and quarters for the vending machine. Can’t wait to see your little girl. Congrats again Momma. excellent! thank you so much for sharing this info. one question: what brand of mesh undies do you use? I never even thought of that! but I guess they might be veeeeery useful ???????? haha they are AMAZING. And I have no clue what brand they are- they’re just the undies the hospital provides. I made sure to bring a ton home and they are the besttttt after birth! You’re so well prepared! I need to share this with my friend who is at 35 weeks. I think a lot of people forget to pack something for the hubby, so it’s glad that you included that in there too! Aw thanks! :) And yes, gotta remember the hubs! What brand are your slippers? So you have a link to them? Hi Katie!!! 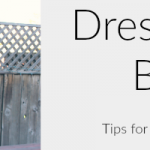 Thanks for posting this–really helpful for a new mom-to-be here. ;) Question…what brand of dry shampoo do you use? Thanks!!! Katie did you use your Belly Bandit? What are your thoughts? Im debating on getting one! Great list! Depending on what type of birth you have planned, it can also be helpful to pack some positive affirmations or pictures to help focus, a swim suit top (I used the bath in the hospital), and lollipops help keep the mouth from getting dry while breathing. Oh, and some snacks for you! I delivered one of my boys at night and I was so hungry after but the kitchen was closed. I’m preparing for baby number 3 here in 7 weeks! Great ideas! :) Best of luck to you with baby #3! So exciting!! 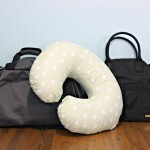 Where did you get your boppy cover from?? What bag is that? It looks like a JuJube but Im not sure. Where did you get that beautiful carseat from?! I loveeee that it is all black. What brand is the car seat that you have in the cover photo for this post? I’ve been looking for a sleek, black car seat! What color backing does your boppy have? After deliveries at multiple hospitals I highly recommend asking for a tour and a list of what they provide! I needed lots of clothing for my little because they did not have any and he had some major spit ups. So, valued item #2 laundry detergent to go! Those sweet little outfits I did have for him got stained after the puke bombs and no immediate treatment. Hi, i’m on my way to son #2. What I’ll take in addition this time in my hospital bag: paracetamol (I refuse to wait for the nurses to come check on me specially during the night), a pacifier for the baby and a wrap for making him cosy. Congrats on baby #2, girl!! :) Great picks, too! Gotta bring your own wrap- always a plus if it’s a cute print, too. I would definitely add preemie size clothes too for baby! My first I was excepting all my newborn stuff to fit & she came out a healthy 5pound baby. My husband had to go get some outfits for her to wear & a coming home outfit.